Puzzle designs for presentations in PowerPoint. This Puzzle Bundle includes the template sets, Puzzle Toolbox 2D and Puzzle Toolbox 3D that contain various puzzle graphics, timelines, mind maps and many more predesigned PowerPoint elements. By using Puzzle graphics, you can stress various content and ideas. On the one side, you may demonstrate an overall context that consists of many individual pieces or, on the other side, indicate missing pieces of an ongoing procedure. In addition, you may also emphasize the significance of a well-coordinated teamwork within a working network. 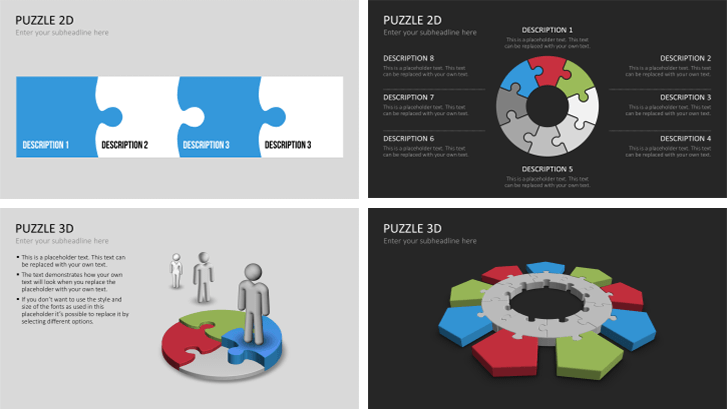 The Puzzle Bundle consists of the template sets Puzzle Toolbox 2D and Puzzle Toolbox 3D and provides numerous graphics, symbols, icons and PowerPoint designs. When using predefined templates for business presentations, you can meet any professional requirements.